Bose Professional is introducing ArenaMatch DeltaQ array loudspeakers and ArenaMatch Utility loudspeakers for outdoor installations. ArenaMatch arrays incorporate DeltaQ technology, to bring improved sound quality, consistency, vocal clarity and flexibility to outdoor installations — sports stadiums, arenas, outdoor entertainment centers, and more. Featuring an IP55 weather rating, ArenaMatch DeltaQ modules make it easy to create durable and reliable outdoor loudspeaker arrays that bring consistent, intelligible sound to listeners. DeltaQ array technology allows directivity, or “Q,” to vary in each module to more precisely match coverage to audience area. With nine coverage patterns available, designers can choose from modules with 10-, 20- or 40-degree vertical coverage and easily swap between 60-, 80- or 100-degree horizontal waveguides — even in already-assembled arrays — to adjust horizontal coverage and create asymmetrical patterns where needed. By reducing the number of modules required, ArenaMatch loudspeakers can help improve sight lines, reduce array weight, and lower overall system costs compared to some conventional arrays. Most importantly, the coverage flexibility of ArenaMatch loudspeakers means more sound going where it is needed. ArenaMatch offers a turnkey solution for entire outdoor sound systems. Designers can employ 40-degree ArenaMatch array modules for point-source applications and 10-, 20- and 40-degree modules for line arrays — all with the same transducers for consistent tonal balance. Combining ArenaMatch loudspeakers with ArenaMatch Utility loudspeakers, which blend seamlessly to deliver complementary and consistent zone-fill coverage, makes equalizing the system much easier. ArenaMatch loudspeakers also interface perfectly with Bose PowerMatch amplifiers, ControlSpace DSPs and ControlSpace Designer software (as well as Dante connectivity), which simplifies setup and monitoring, saving users time with loudspeaker presets for EQ, limiter and crossover settings. For outdoor sports complexes, ArenaMatch loudspeakers provide clean audio for the entire spectator area – delivering announcements and play-by-play calls clearly. 14-inch neodymium woofer and six Bose EMB2S titanium-diaphragm neodymium compression drivers in each module deliver intelligibility. And when it comes to music, ArenaMatch loudspeakers deliver clear, long-throw music reproduction. Weather-resistant features include a three-layer stainless steel grille, water-resistant woofer cone coating, industrial polyurethane exterior coating and a molded input cover. All ArenaMatch models ship standard with bi-amp capability, a passive crossover, and 70/100V transformer inputs, so they’re adaptable to a variety of configurations. They also include M12 threaded inserts with internal steel link bars for use with Bose accessory mounting hardware or custom array frames. Built for zone-fill coverage or high-SPL foreground music, four new Bose ArenaMatch Utility loudspeakers feature similar tonal balance to ArenaMatch array modules but in compact designs. They have the same EMB2S compression driver as ArenaMatch arrays, ensuring consistent sound, and the same IP55 weather rating. Deploy them for zone-fill coverage in sports stadiums, arenas, outdoor entertainment centers, and more. Or use them to provide intelligible, high-level sound in any outdoor area — from niche venues such as breweries and fairgrounds to larger settings like resorts and outdoor shopping centers. 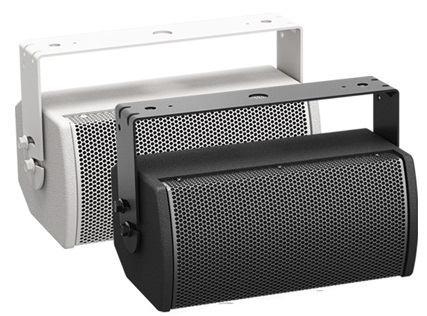 These loudspeakers provide wide, even coverage via a constant-directivity high-frequency horn, which can be rotated for horizontal or vertical installation. ArenaMatch Utility modules can perform in the most demanding applications with the largest model (AMU208) featuring 70 Hz – 16 kHz frequency response and 126 dB maximum peak SPL, with all models supporting the lowest vocal range. ArenaMatch Utility modules can mount easily with included stainless-steel U-bracket.